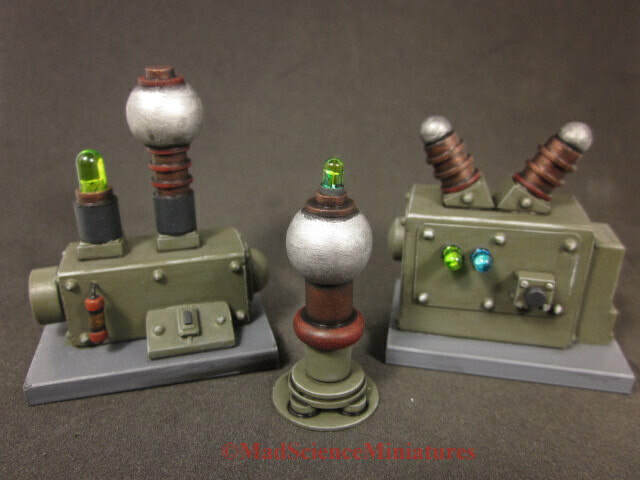 Unique handmade one inch scale dollhouse miniatures featuring mad science laboratory equipment, archaeological curiosities, steampunk inventions and more. "They called me mad, back at university. Perhaps, if 'mad' is being able to look at things differently than others, to see things as others fail to do. To seek a greater understanding of the universe around us and to unlock its hidden workings through scientific investigation. Well, then, perhaps they were correct in their diagnosis." - From the personal journals. 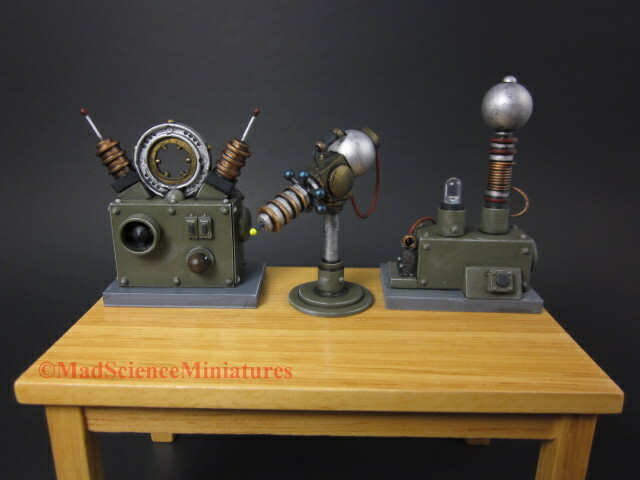 Let me offer you a sample of my workshop devices. They should make intriguing accessories to your own laboratory and I am glad to share them with one who is like-minded in challenging the borders of known science. These devices make interesting additions to your dollhouse collection. They would look right at home in the study of a Victorian scientist, the workshop of a Gothic inventor, or the secret lair of a 1950's mad scientist. 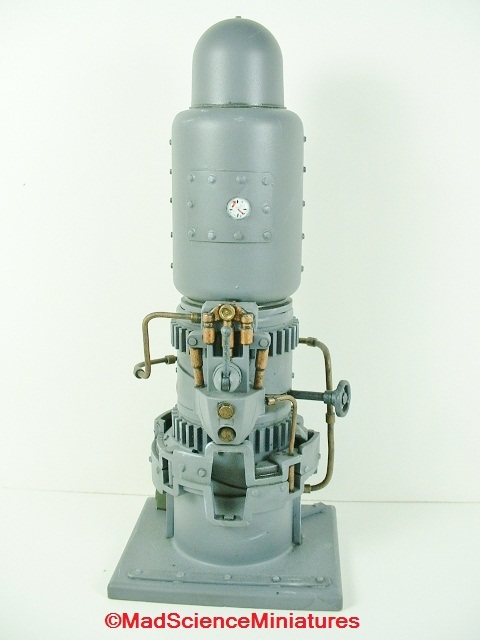 If you do not have a fully equipped laboratory in your house, simply place the item in an otherwise "normal" room and wait for your visitors to ask about the unusual bit of furnishing. 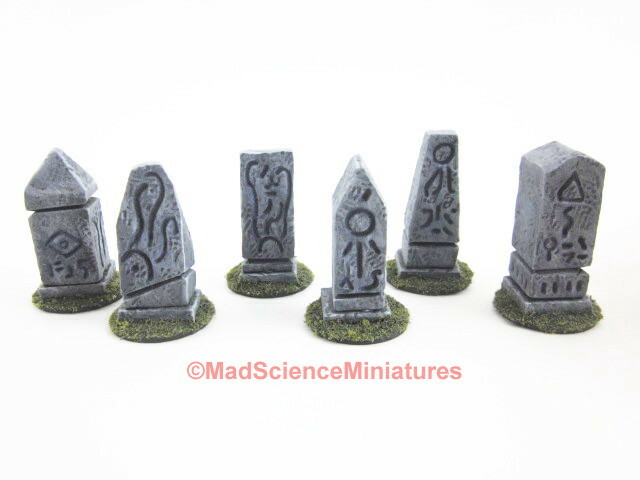 "Exceptionally well made I love all of these Mini's. 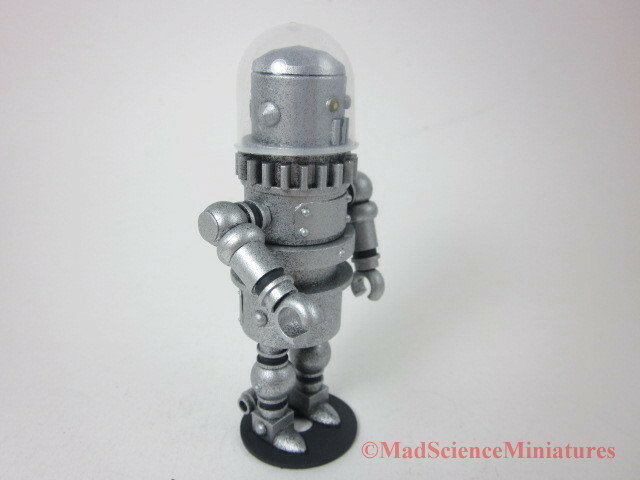 They will be a very cool addition to my Halloween mad scientist castle doll house." "The universe is full of things that are too strange for the human mind to fully comprehend. But that is not to say that Man does not always try. Such things were the object of my Aunt Beatrix's travels. She spent much of her adult life roaming the globe, poking into its darker corners, seeking the odd bits of archaeological treasures linking civilized man with our distant relatives. She collected many cultural artifacts and specimens, many of which came into my possession after her mysterious disappearance on her last scientific expedition some years ago." - From the personal journals. These pieces represent archaeological artifacts found among Aunt Beatrix's archives. Many exhibit archaic properties whose true meanings are lost to the sands of history. Some appear to embody aspects of the Cthulhu Mythos that were recorded in the (so called) fictional tomes of H. P. Lovecraft. "Love this!! It's so quirky and delightful. Thank you so much for your service." "When the great naturalist Charles Darwin embarked on his historic voyage of discovery on the HMS Beagle in 1831, he collected a vast amount of knowledge on the natural world, including the great diversity present in the plant kingdom. Although he studied the facets of plant movement and the feeding habits of the insectivorous plants, Darwin only touched on the edges of flora adaptation. Aunt Beatrix collected many specimens from around the globe that would have excited Darwin far beyond his own discoveries." - From the personal journals. Flowers and plants often appear in the dollhouse world. But why stop at the common and mundane in your miniature floral world? 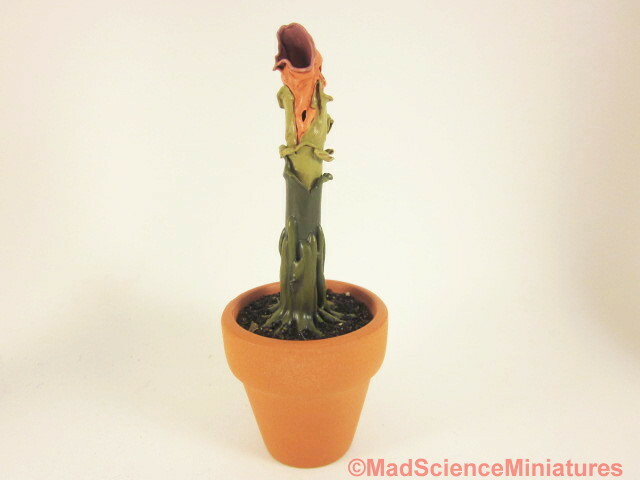 These unusual specimens of the plant kingdom can add a touch of uniqueness and strangeness to your scale conservatory. "Very creative item. I am delighted." 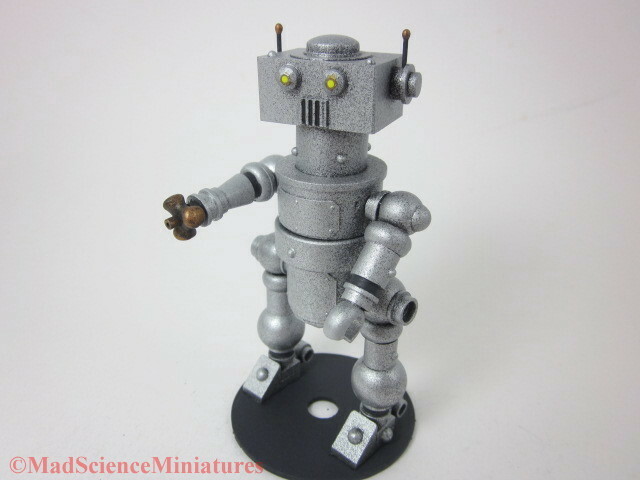 Every well appointed mad scientist requires a robotic assistant in the laboratory or just to help about the house. 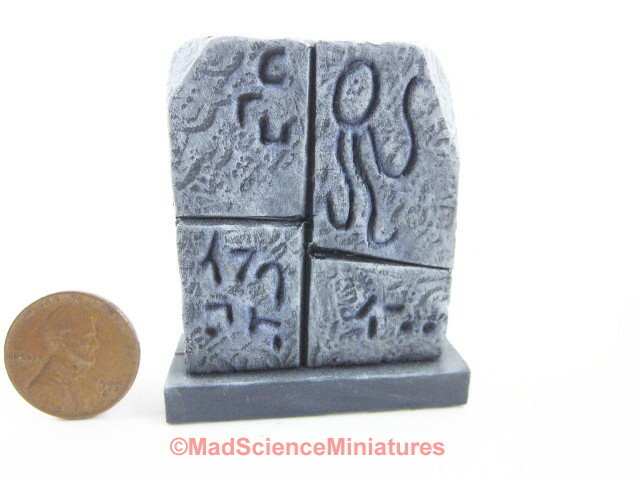 "Made me want to cackle like a mad scientist myself when I examined this piece! So cool and the quality/detail is wonderful! Great value for the price, warp speed shipping and excellent packaging. Vendor has top quality goods!" 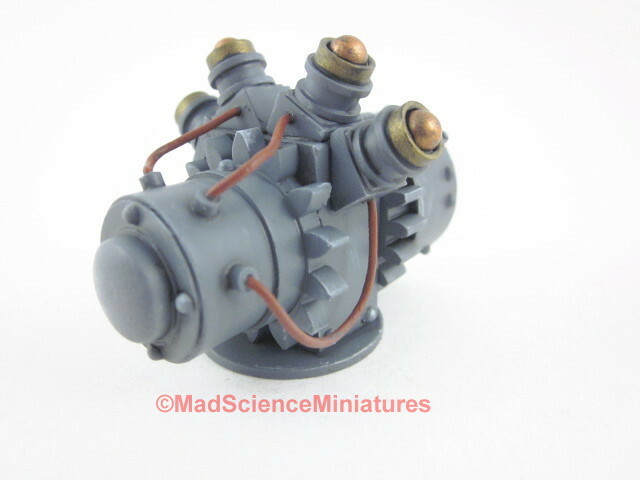 All contents including photos Copyright 2012-2019 - Mad Science Miniatures / Adventures & Hobbies - All rights reserved. Warning: These items may contain small parts, sharp bits, and other potentially hazardous properties. They are intended for the adult collector and are not designed for children of any age. 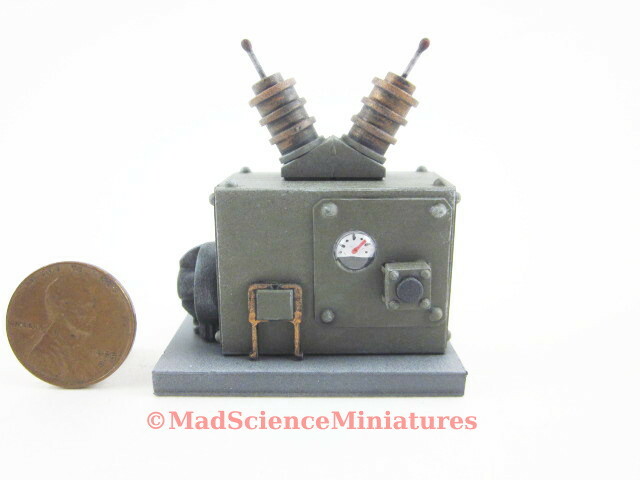 Mad Science Miniatures - Scientific curiosities for the dollhouse collector.